These are the main characters of Clash of Clans. You can use these to attack other players with (or when playing campaign map). You can create these characters in the barracks and they will find their home in the army camps. The Barbarian is the first unit you unlock in the barracks. 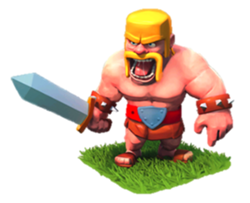 The Barbarian’s appearance is a man with an angry, battle-ready expression, yellow hair and a long yellow mustache. He wears a brown kilt with a leather belt and an iron shield-shaped buckle. He also has a spiked wrist-band on both arms, as well as a short sword in his right hand and sandals on his feet. The Barbarian gains a head band upon reaching level 3 and a viking helmet at level 5 and level 6 barbarian received sharper sword and mighty horn helmets. The archer is a ranged unit. 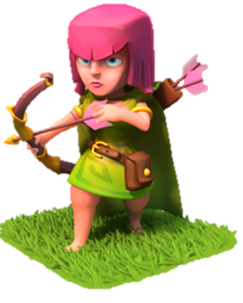 It is depicted as a female with pink hair and sharp eyes, a light green dress, a belt with a small bag attached to it, a golden ring on her shoulder, and pink feathers for her arrow flights. Archers have no preferred targets, attacking whatever comes within their range. 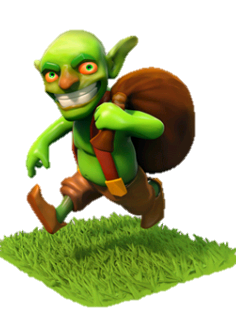 The Goblin is the fastest character in the game. Their first target is resource buildings making them the ideal troop to deploy if your primary concern from a raid is collecting resources. They deal double damage to resource buildings (gold mines, elixir collectors and storages for each). This means that they deal more than 2x as much damage as Barbarians and 3x as much as Archers to these types of buildings! The trade off is their relatively low health which is higher than an Archer but lower than a Barbarian. Also, because the nature of the character is to attack resource buildings first, ignoring all defenses, they can be vulnerable to attack and should not be deployed without another type of troop for support. Giants are large troops capable of taking huge damage, but deal very little in return. They primarily target defenses, so in a large group they can be very strong at crippling a village. Due to their high health, players usually deploy them first in order to protect the other weaker but more offensive troops from defenses. 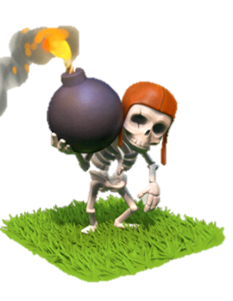 Wall Breaker’s appearance is that of a small skeleton that wears a brown aviator hat and has a small scar across its right eye. It carries a large bomb. Wall Breaker attacks by running directly to its target, the nearest wall, and blowing itself up kamikaze style. It deals splash damage around the enemy and deals 40x damage to walls. The wall breaker will keep hitting any wall until all are gone, even if you put it far away from any wall. Each time the wall breaker is upgraded, the bomb it’s holding becomes larger. At level 3 the bomb becomes larger. At level 5 the Wall Breaker’s bomb turns golden. 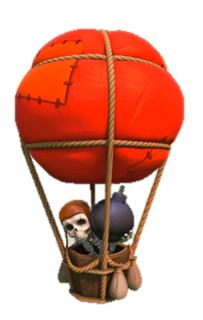 Balloons are slow moving aerial units that do devastating amounts of splash damage to ground targets. Balloons, like giants, target defensive structures first. The wizard is a magical unit that wears a blue cloak depending on it’s level and a leather belt with golden buckle and brown boots. The wizard is very similar to the archer in that it uses a ranged attack and can shoot over walls. It shoots fireballs that do high damage, but it requires support as it has relatively low hitpoints and can easily be killed by defenses. The Healer is a flying unit. She has no attack abilities, but can rapidly heal any ground units, except when in defense (in which case she heals damaged buildings). When the healer is deployed, a halo appears around her. If all units have full health, she won’t do anything. Should a unit be hurt by a defense, she will fly over and start healing. Note that Healers will not heal flying units (other Healers / Dragons / Balloons) or itself (unlike a healing spell which heals everything, healers included). The dragon is a fearsome flying unit and is capable of terrorizing both ground and air units. 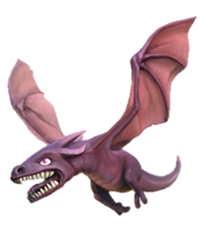 Unlike the balloon, which also flies, the dragon has a ranged attack, similar to archers. 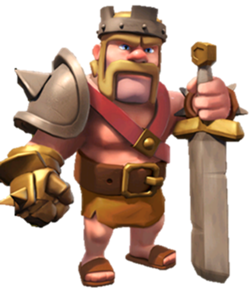 The P.E.K.K.A is the last troop to be unlocked in the barracks. It has the strongest armor and damage of any unit in the game. However, it is the most expensive of them all. She has purple crystal spikes growing on her side, and carries a sword. At level 3 a P.E.K.K.A’s armor color changes from dark blue to black, giving her a tougher look. The Barbarian King is bigger than a Giant and toughest of all Barbarians! 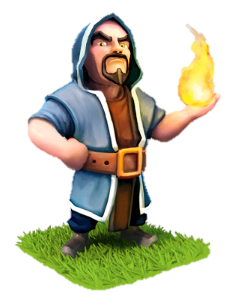 Create him out of Dark Elixir and let him loose on an enemy village!! The Barbarian King is an immortal unit, so he only has to be trained once. However, if he falls in battle he must regenerate his health by putting him to sleep before he can be used again. Also, when you attack a barbarian king while it’s still recharging, their alter will be empty. 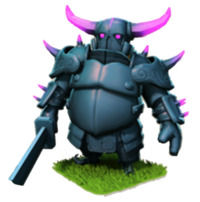 The Barbarian King can be unlocked from the Barbarian King Altar, which costs 10,000 Dark Elixir. 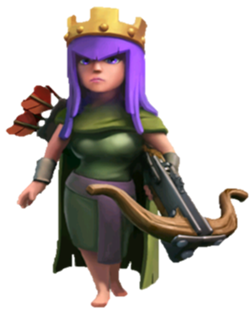 The Archer Queen is an immortal unit so she only has to be trained once. However, when her health is lowered in battle she must regenerate before she can be used again. The amount of time she sleeps is directly proportional to the health she has left at the end of the battle. So if she is not damaged then she is ready to fight immediately however, if she falls in battle then she must sleep for the full regen time shown below. This is the best game i’ve ever played. my favorite character is the Barberian King. Great article with very good descriptions on every character, good job! I like it. Great,very useful info,dark barracks should have more dark characters though,I’m sure the guys are on the case! Fab thanks. I’ve learn several good stuff here. Certainly price bookmarking for revisiting. I wonder how so much attempt you place to make such a magnificent informative website. IT IS THE BEST GAME EVERRRRRRRR!!!!!! Please insert more troops like flying barbarian , golden archers , Giants having golden hands , dragons LVL 5 , and a new person likes a heater who heat up the resources to loot,, a new person who’s favourite target is town hall ,,,new DEFENCES like dragon tower, new features like COLEADERS should not edit anything,, new kinds of clan flags,,,new decorations like flags of Sirilanka,PAKISTAN, sun and moon flags ,,,,,,,,,etc. hai saya mau gems CoCya saya mohon macam mana cara dapatkan gems plizzzzz…..
i have all the character 99999999999999999999999999999999999999. all thing max. I love Dragons and Giants but if you want to get Unlimited Gold, Gems and Elixir in Clash of Clans then you must have this App, Clash of Lights. I already tried it and Enjoying this awesome app. You can get it from hereClash of Lights It is the best Mod Apk of Clash of Clans. CLASH OF CLANS is the best game EVERRRRRRRR!!!!!!! I can’t figure out who the little guys are on defense when I go into a village….there’s tons of them and they even kill my giants! Can you tell me what they are and how to get my own? Missed the dark barracks troops. 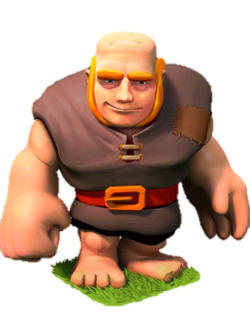 Did you type *retard when describing the Barbarian King on accident? Oops! Can’t remember anymore, but it’s been changed. Thanks for notifying.